Our steel fire rated doors are certified to FD240 meaning they offer up to 4 hours of fire protection. Ideal for applications such as commercial and industrial premises, they can also be used as a connecting door from your garage into your home. All of our fire rated doors are carried in stock and available from just £549.99+VAT. As they have been fully certified they are compliant with fire safety regulations as required by UK law and will help to slow the spread of fire in an emergency situation. Our fire doors are available as standard in signal white (RAL 9003) or Anthracite Grey (RAL 7016). They can also be powder coated in a wide range of colours to suit your personal requirements. We also have a range of Fire Exit Doors available here. Our steel fire doors are certified up to FD240, offering a maximum of 4 hours of fire safety. These doors are ideal for internal installation where a fire rated door is required, and are available in Signal White (RAL 9003) and Anthracite Grey (RAL 7016) from stock, with a range of other colour options if required. In accordance with fire protection regulations, these doors come supplied with a door closer fitted on the push side of the door. If these sizes don’t fit your requirement we have custom made fire rated doors also available. Our fire rated personnel doors offer an FD240 rating which allows for up to 4 hours of fire protection. These fire doors come supplied with a door closer fitted on the push side of the door, In accordance with fire protection regulations, and are also fitted with a letterbox as standard. 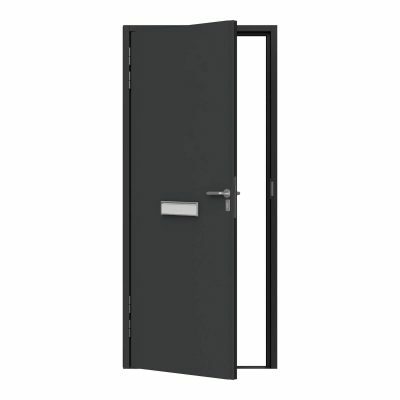 These doors are ideal for internal installation where a fire rated door is required, and are supplied in RAL 9003 – Signal White or RAL 7016 – Anthracite Grey from stock. We also offer a powder coating service with a wide range of other colours available if required. If this door doesn’t fit your specification we also have custom made fire rated doors available. Our fire rated double doors are FD240 certified, meaning they offer a maximum of 4 hours fire protection. In line with fire protection regulations, these double doors are fitted with door closers on the push side of the door, and are fitted with fire rated door furniture. Ideal for internal installation where a fire door is needed, they and are available in white (RAL 9003) or anthracite grey (RAL 7016) from stock. We also have a variety of other colour options available if required. 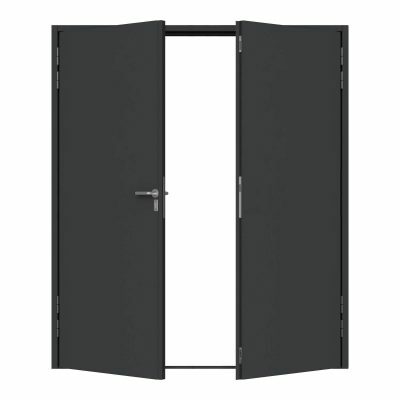 All door sizes are available as left hand active leaf opening out, or right hand active leaf opening in. If our stock sizes don’t fit your need we have custom made fire rated double doors also available.